After having too much fried chicken lately, I decided to go for something healthy by visiting Nori Casual Japanese Restaurant. Taking public transit from SFU to Nori Casual is neither very easy nor convenient. I had to make three transfers in quick succession, which precluded any opportunity for me to catch up on missed sleep. Furthermore, it's a little hard to sleep on the bus when other people are having an argument behind you (welcome to Surrey). I could almost say that the people on the bus were going up and down. However, none of this matters as long as the sushi is good, right? 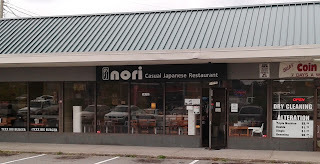 Nori Casual is located a few blocks northwest of Guildford Town Centre in a mostly residential part of town. 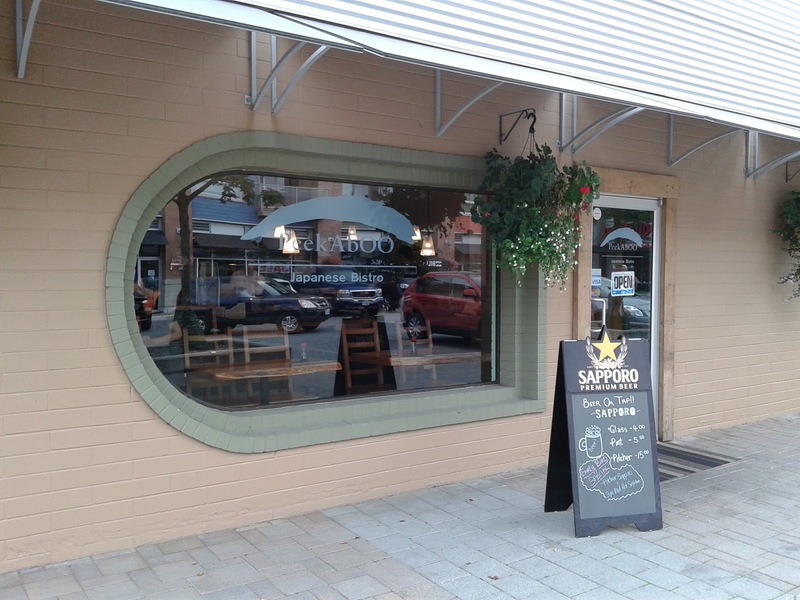 I would never have found out about the restaurant if I wasn't a regularly reader of Vancity Noms. The restaurant is run by an older Japanese couple and serves mainly traditional Japanese food, including numerous donburi and udon dishes. Unfortunately, they had just discontinued their omurice, so I went with one of their twelve different kinds of udons instead as my filler. My lunch started on a high note when my three pieces of nigiri turned out to be carefully constructed. The tuna toro (they added the word tuna because they also served Salmon Toro) had a delicious smooth, melty texture. The Scallop Nigiri was garnished with tobiko and minuscule pieces of cucumber. I appreciated the harmonious sweet flavour and the innovation, but texture-wise, this didn't really do it for me. 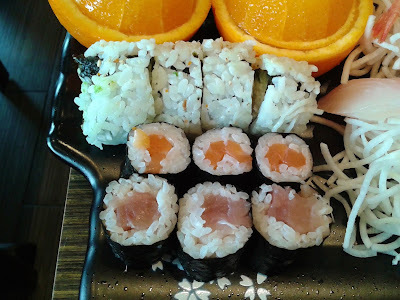 The sockeye salmon had a rich flavour, and the sushi rice was decent and not packed too tightly. 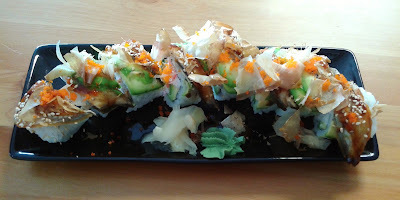 The Black Dragon Roll came with BBQ eel, avocado, tobiko, crab meat, cucumber, bonito flakes, and sesame seeds, and for $7.25, it was quite a good deal! 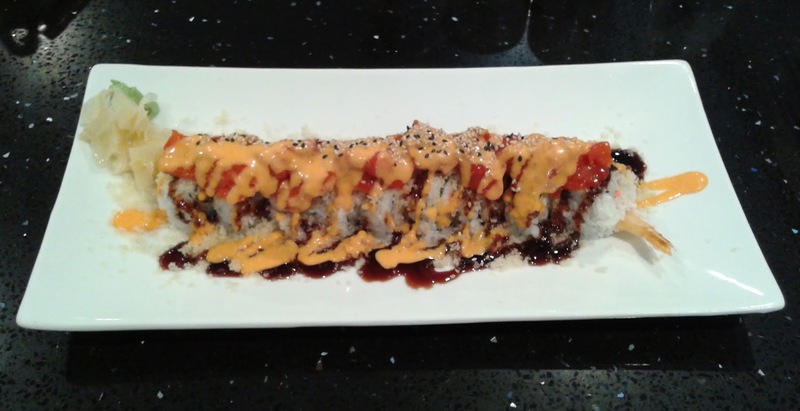 This is even cheaper than the Dragon Roll from T&T, and I'm sure you know just how good that is. The rich unagi blended well with the avocado, and the crab meat was very soft. It didn't have the most natural flavour, but it is imitation crab meat after all. My Tanuki Udon came with a side of Spring Rolls. 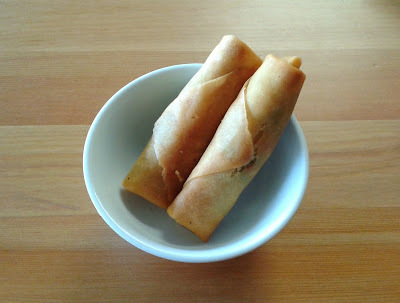 The wrapping was quite crunchy since it was on the thicker side, but the cabbage-based filling was moist and juicy. I also enjoyed the small bit of black pepper they added to the filling to give it the slightest touch of spiciness. 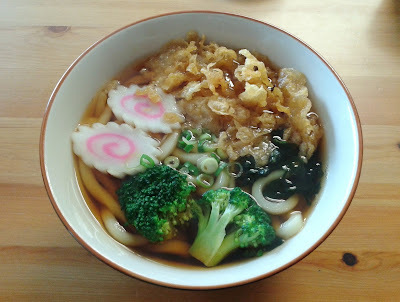 The Tanuki Udon consisted of broccoli, fish cake (naruto), seaweed, green onion, and lots of tempura crumbs. So much for healthy eating! The udon noodles were on the softer side, and the udon broth was rich due to the seaweed and the huge mass of tempura crumbs. I let the tempura crumbs soak in the broth until they became fluffy and pillowy, since that's how I enjoyed tempura udon as a kid. Unfortunately, since the tempura crumbs were slightly overdone to begin with, things ended up getting really oily by the time I neared the bottom of the udon. That being said, the Tanuki Udon did taste quite good in the beginning. The couple who ran the restaurant were friendly, although they don't seem to be the most talkative people. The interior, as suggested by the restaurant's name, is neither fancy nor modern, but things were kept clean and orderly. 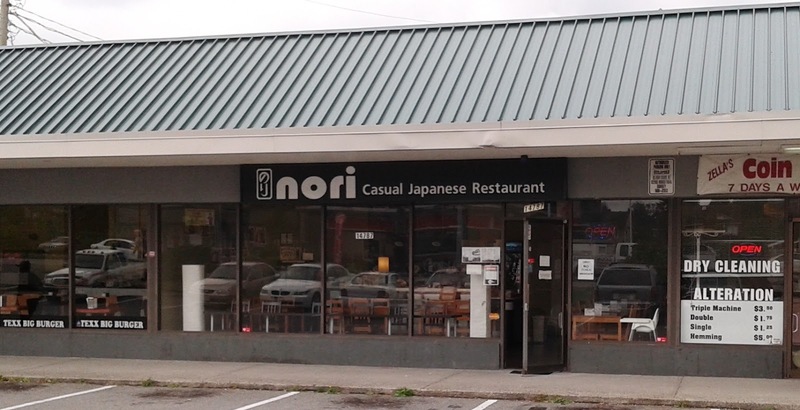 Nori Casual isn't a place for fancy, first-class food. 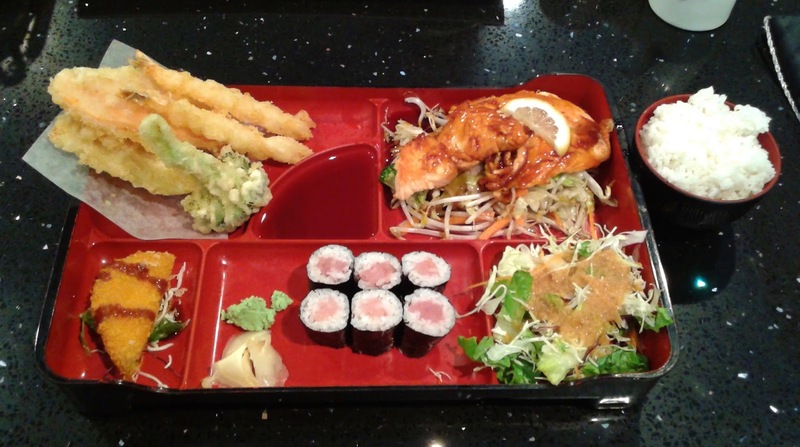 It is a place for decent, affordable Japanese food with a slight homemade touch. 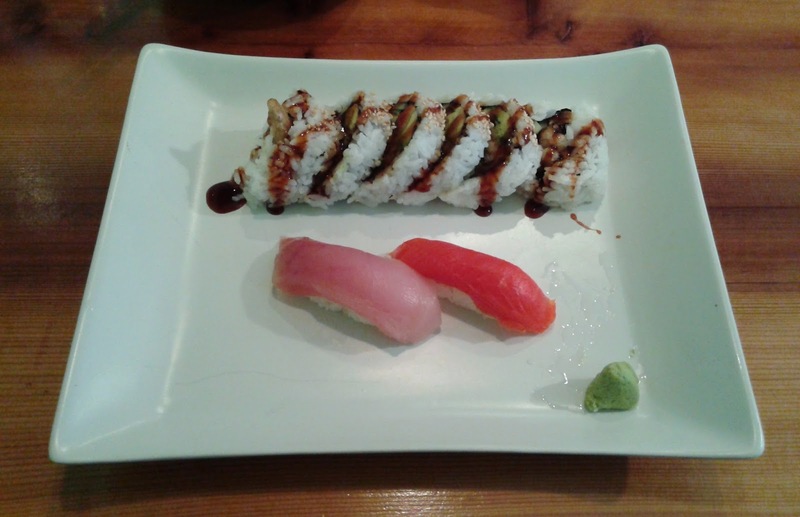 After school had started and Katie had received her Compass Card, one of the first things on her mind was to go on a sushi adventure with me. We ended up selecting Sushi Garden, which is perhaps the busiest Japanese restaurant on Kingsway. We arrived at 2:45 p.m. with hopes that the restaurant would be less busy and more able to provide us with good service. Our hopes were quashed when we opened the door to find that the restaurant was 90% full and as loud as ever. On the bright side, at least they had an empty table for us. 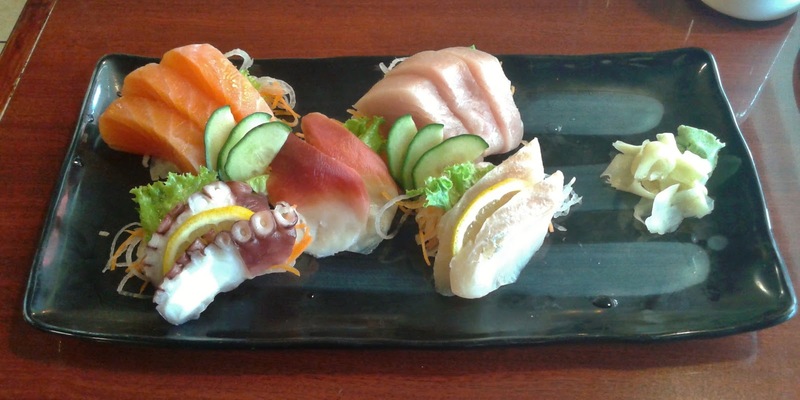 Sushi Garden is Korean-operated and is one of Metro Vancouver's most popular places for budget sushi. They had raised the prices slightly since my previous visit, but it appears that this has done virtually nothing to curb the number of diners. Perhaps what will actually do the trick is their plan to open a third location closer to Highgate Village. Since Katie wanted sashimi and I had no idea what I wanted, we decided to get the Love Boat. The first item to arrive was the Miso Soup, which was garnished with tofu, green onion, and copious amounts of bean curd. 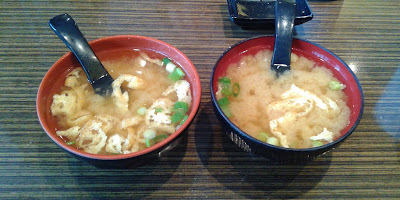 The bean curd gave the Miso Soup a rich flavour, and both of us liked how the soup was not too salty. 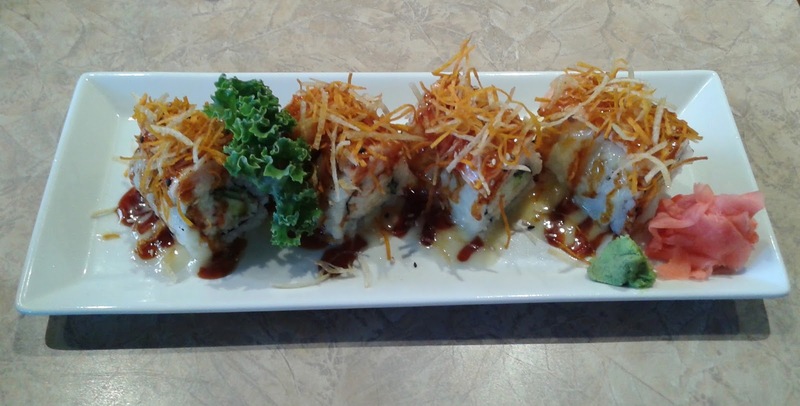 The Alaska Roll is not part of the Love Boat, but I felt compelled to order it since it is one of the most well-received items at Sushi Garden. The Alaska Roll came with avocado, tobiko, and salmon and was dressed with a Japanese salad dressing (an apple-based vinaigrette). The salad dressing went very well with the soft, creamy avocado and enhanced the flavour of the smooth salmon. My only concern was that the roll looked a little unappetizing, and I had to persuade Katie to try it. If our definition of a boat is anything that looks like it may float, then I suppose this can be called a Love Boat. That being said, the Love Boat contained a massive amount of food, which included 18 pieces of sashimi (21 if each of the amaebi shrimps counts as one piece), 8 pieces of nigiri sushi, 10 pieces of makizushi (rolls), and 2 orange desserts. 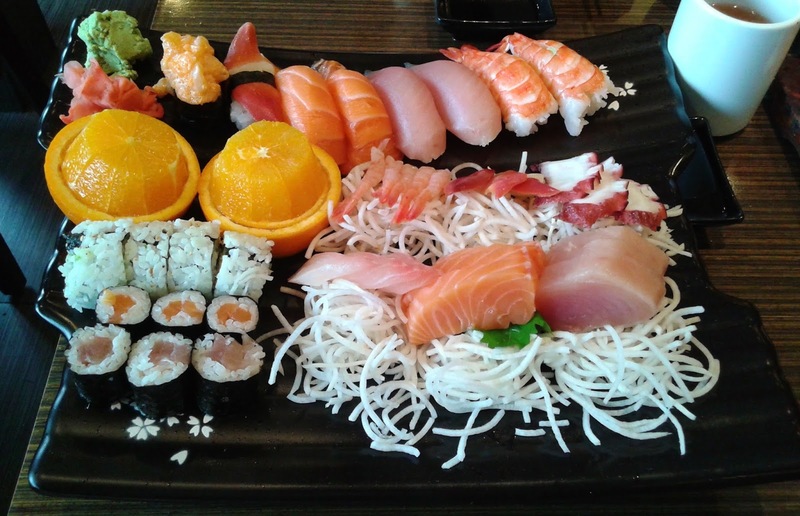 We dove right into the sashimi and quickly noticed that most of the pieces were quite big. The Amaebi Sashimi was fresh with a creamy texture and a sweet flavour. 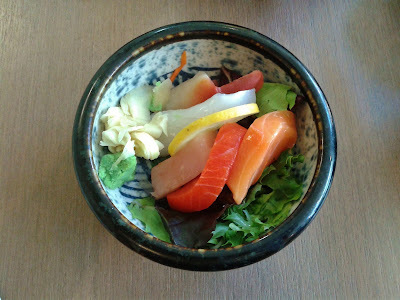 The Hokkigai Sashimi was cut into smaller pieces but was sufficiently sweet. The Tako Sashimi was overly chewy and thick, but not too salty. The smooth Tai Sashimi was rich in flavour. The Tuna Sashimi was quite soft and was fresher than the Salmon Sashimi. My favourite piece of nigiri was the Chopped Scallop Nigiri, which was creamy, sweet, and contained soft scallops whose flavour was enhanced by the masago. Katie had the Hokkigai Nigiri, which she thought was a bit tough. The Salmon Nigiri and the Tuna Nigiri came with really big portions of fish, while the Ebi Nigiri was quite chewy and sweet. Unfortunately, the rolls in the Love Boat did a good job of showcasing the poor sushi rice. The sushi rice tasted like dried-up soggy rice, or in other words, ochazuke gone wrong. It reminded me of T&T's sushi rice. The cucumber overpowered the other ingredients in the California Roll, while the sushi rice overpowered the fish in the Salmon Roll and the Tuna Roll. The Orange Dessert was presented nicely. The orange was juicy, but was neither particularly sweet nor sour. The service was a little sparse, but I found that acceptable since the restaurant was quite busy. However, towards the end of the meal, after the restaurant became half-empty, I was given the bill before I asked for it, without any word or explanation. This happened at the North Burnaby location, and it happened again here. Why do they keep doing that? In the end, it seems that the low prices (even after the price increase) are the restaurant's biggest virtue. I'm not a big fan of rain, so when I heard that showers were in the forecast, I decided to travel all the way to Tsawwassen, which is about 40% drier than Downtown Vancouver. Of course, I used the travel time wisely by catching up on many hours of lost sleep. Things appeared to be in good order when I arrived. Not only was there some sunshine, but a few enthusiastic strangers gave me a high-five after I had hopped off the bus. Welcome to Tsawwassen, I guess? PeekAbOO is Japanese-operated, and I think the restaurant is aptly named because it was genuinely difficult to find. 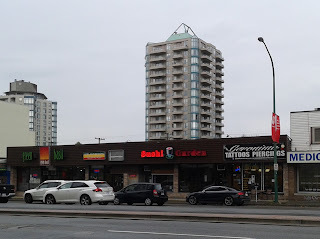 I spotted the two other Japanese restaurants in the vicinity with virtually no effort, but this place was hidden in the back end of a rather decrepit mall that showed nearly no signs of life. The time it took me to find the restaurant was enough time for me to give birth to a child. Oh wait... Anyways, I entered the restaurant and snagged one of the larger tables so that I could have ample room to order lots of food and take photos. I quickly felt bad about doing so because it took almost no time for diners to occupy all of the other tables in the restaurant. The first dish to arrive was the Beef Shabu Shabu Salad, consisting of a large dish with thinly sliced beef on top of a green salad. 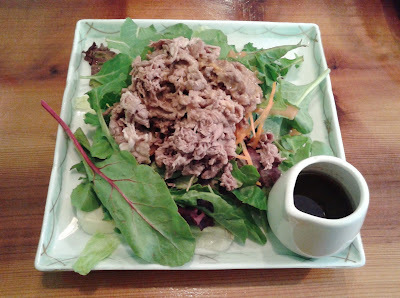 The beef was tender (but not any warmer than the salad) and was dressed with a slight helping of peanut sauce. The waitress informed me that the dipping sauce was made with soy, olive oil, and garlic, but it tasted tangy as if there were vinegar and mirin mixed in as well. I preferred the peanut sauce, but the dipping sauce was not a bad substitute after I ran out of peanut sauce. 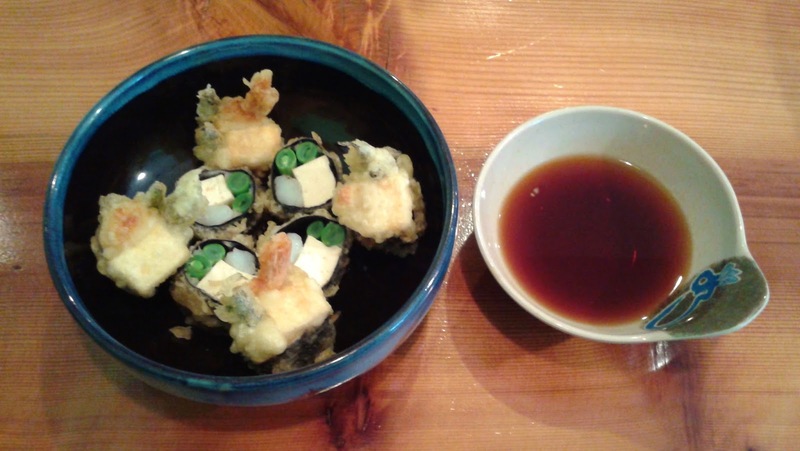 The PeekAbOO Agedashi was a unique take on Agedashi Tofu and consisted of tofu, asparagus, and prawn wrapped with seaweed. Each piece was then surrounded by light and crispy tempura batter. I could sense lots of textures within each piece, from the meaty prawn and the pillowy tofu to the crunchy but juicy asparagus. Aside from the fact that there was no clean way to eat the two pieces with the prawn tails, I really enjoyed the innovation and careful preparation of the PeekAbOO Agedashi. 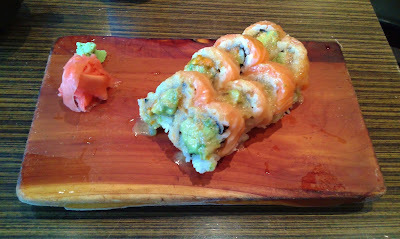 The unagi in the Unagi Tempura Roll was moist and rich in flavour, and the avocado had a nice creamy, buttery taste. The unagi sauce had a thick consistency and was very sweet and savoury, so the roll required very little soy sauce, if any. 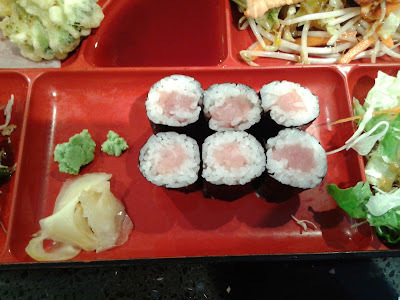 The Tuna Nigiri was soft and not fishy in flavour. 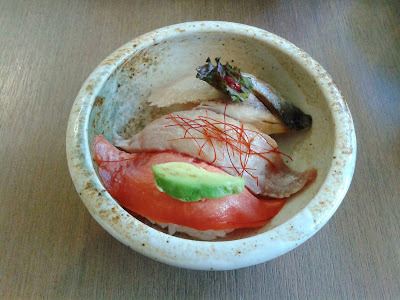 It had a better fish-to-rice ratio than the Salmon Nigiri, which also tasted fresh, but came with a meagre portion of sockeye salmon. I didn’t find the sushi rice particularly flavourful. 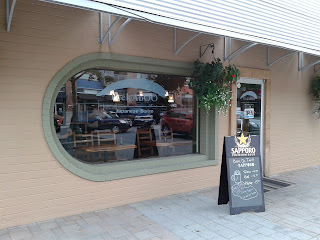 The service was quite friendly, and I enjoyed the cozy but lively environment. The menu is not extensive, but there are a number of innovative dishes. The food was mostly well-prepared, and although the prices are on the higher side, I felt that the healthy stream of customers was justified. I suppose this adventure was worth the travel time and the search time! Kita no Donburi is a very popular place to have lunch for everyone who just happens to be in downtown during lunch hours. 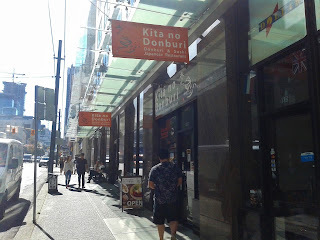 The last time I visited Kita no Donburi was a few months ago, when I was working on a group project at SFU's downtown campus. We were only taking a 15-minute break, so I had to order takeout. Although Kita no Donburi is very efficient at preparing food, I took much longer than 15 minutes to return to the meeting. Furthermore, because my lunch set consisted of many separate items, I took up more than my fair share of the table and made loud crunching sounds (with the tempura) while my teammates were discussing the next steps of our project. Of course, I didn't catch anything that was said. I am, without a doubt, an excellent team member. Since my takeout order ended up being better than I had expected, I decided to make a return visit and order the same lunch set (the Wahoo Shokuya), this time sitting inside the restaurant. Kita no Donburi is almost like a full-service restaurant, but you order and pay at the front counter. There are a lot of donburi rice bowls to choose from, but they also have a page of innovative special rolls. On the other hand, there are neither standard rolls (ex. California Roll, Dynamite Roll, etc.) nor standard nigiri sushi on the menu. The Wahoo Shokuya lunch set came with a bowl of Miso Soup, some Aburi Nigiri Sushi, some Tempura, some Sashimi, and a small bowl of Soba (and unfortunately, no wahoo). 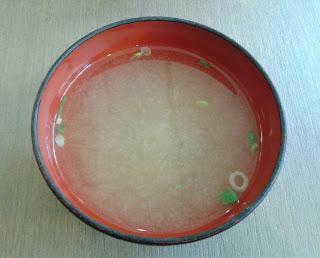 The Miso Soup came with green onion and seaweed and was visibly watery. I stirred it around as much as I could before taking this photo. Most of the flavour seemed to came from salt rather than miso paste. Next, the all-vegetable Tempura came with one piece each of squash, yam, and purple yam as well as two pieces of sweet potato. I think they were out of lotus root, so they had to replace it with an extra piece of sweet potato instead. The batter was thin but hard in places, while the dipping sauce was tangy with a mirin-like flavour. 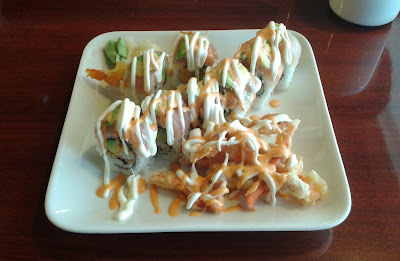 Whether the dipping sauce went well or not with the tempura was debatable. Each of the pieces had a good amount of moisture, and the flavours of the ingredients were preserved well. The purple yam and the yam were the best of the bunch. The three pieces of Aburi (seared) sushi came in a small bowl. I would have preferred a dish instead, because the bowl made it really hard to pick up the pieces without destroying them. 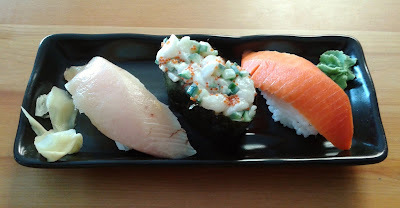 The fish-to-rice ratio was good for all three pieces, but if you are looking for an Aburi flavour, you might be disappointed. The saba (mackerel) in the Aburi Saba Nigiri was rather tough, but not too salty, and the tiny garnish on top was very savoury and tangy (I couldn't quite figure out what it was). The Aburi Tuna Nigiri, dressed with a brushing of unagi sauce, had a nice soft texture. 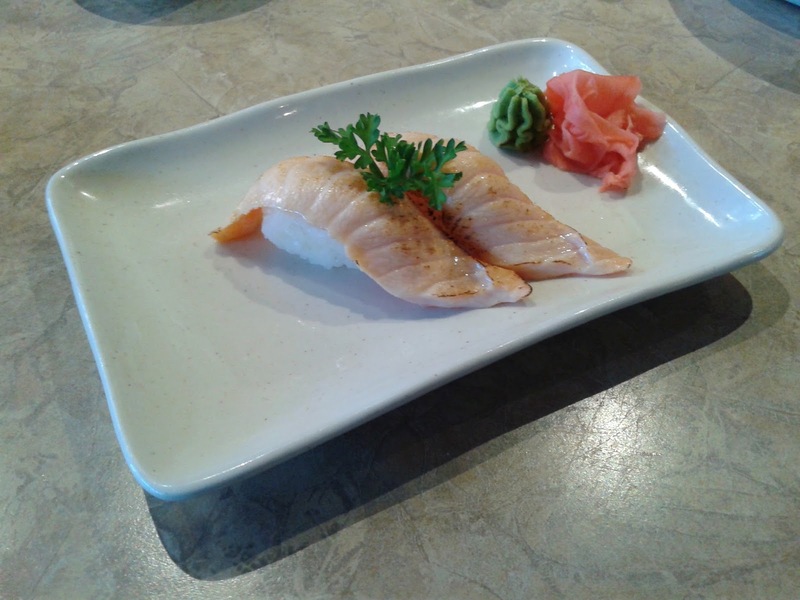 The Aburi Salmon Nigiri was served with sockeye salmon and was deliciously smooth. The Hokkigai (surf clam) Sashimi had a slightly sweet flavour and was quite chewy. The Ika (squid) Sashimi was cut to the right thickness and had the normal sticky texture for ika. The piece of Tuna Sashimi was ridiculously small (it was smaller than my thumb). It had a soft texture, but had a very slight fishy flavour. Both the Sockeye Salmon Sashimi and the Salmon Sashimi were soft and had smooth textures. I still wasn't full, so I asked the server which roll she thought I should try (out of a few rolls that I picked). 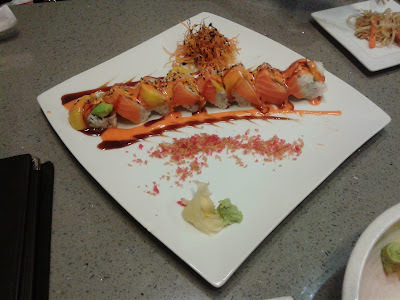 She then ordered the Hanabi Roll for me, which consisted of salmon, mayonnaise, unagi, avocado, cucumber, red and white onion, masago, tobiko, soft white sauce, aburi sauce, and olive oil. The salmon was baked and went well with the avocado, while the red onion provided a unique, subtle zing. The only issue I had with the roll was that the olive oil made the bottom of the roll a bit soggy. 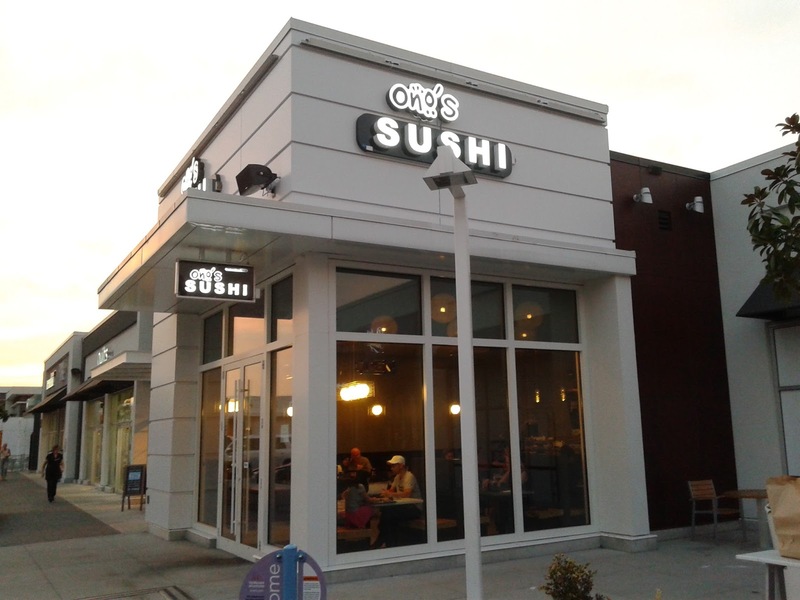 Those of you who are well-acquainted with my previous posts may have noticed my subtle (or perhaps not-so-subtle) expressions of disdain for sushi in Langley. Unless I acquire amnesia someday (knock on wood), I will never forget the "fascinating" experience of having Worcestershire sauce on unagi. However, Vancouver food blogger Miss Vancouver Piggy recently brought to my attention a restaurant that would possibly alter my overall perception of Langley's sushi restaurants. That restaurant is Tokyo Hon Sushi, a rather large Korean-operated sushi restaurant a little off the beaten path in Langley. After my mom and my sister finished picking blackberries from Krause Berry Farms (I tried to join them but I think I picked more insects than berries), we headed over to Tokyo Hon Sushi. As soon as I entered the restaurant, the first thing I saw was a nice, comfortable sofa that took up what could have been dining space for 30 customers (there's a photo of it on the restaurant's website). That's when you know the land prices are too cheap. Nonetheless, their actual dining area was still very spacious, and we were seated by a very friendly waitress with an awesome attitude. 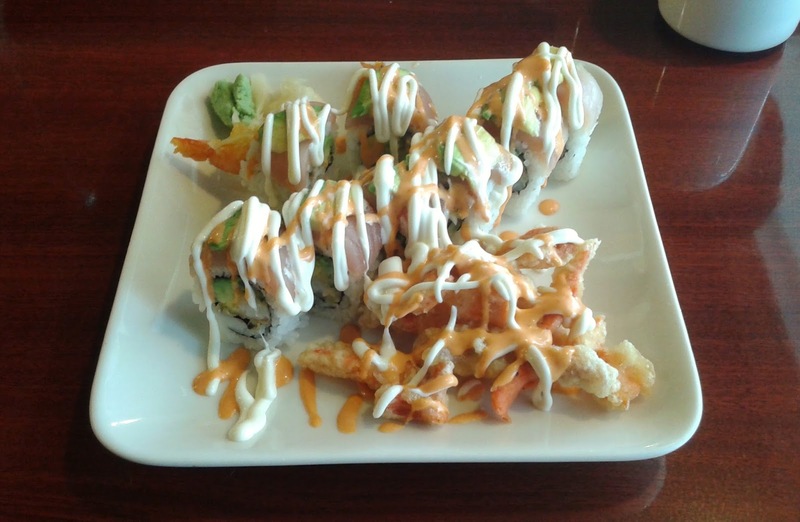 Since the waitress had such an awesome attitude, we decided to order the Awesome Roll, which consisted of avocado, crab meat, seared salmon, yam flakes (which turned out to be yam fries), and a special sauce. The special sauce was unique and quite sweet, and I could taste teriyaki sauce, mayonnaise, and a hint of sweet mustard in it. There may have been a minute amount of melted cheese as well. The seared salmon was sufficiently moist and melty, and the soft texture of the roll was nicely contrasted by the crunch of the yam fries. 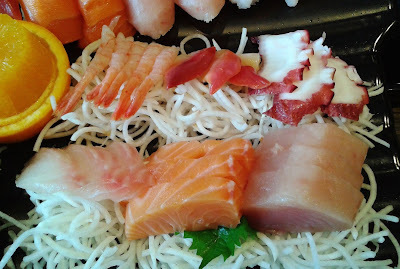 The Assorted Sashimi tasted nearly as spectacular as Sushi Hachi's Chef's Choice Sashimi (in Richmond). However, this sashimi platter came with about three times the amount of sashimi at just 60% of the price (I even received four more pieces than what was stated on the menu). 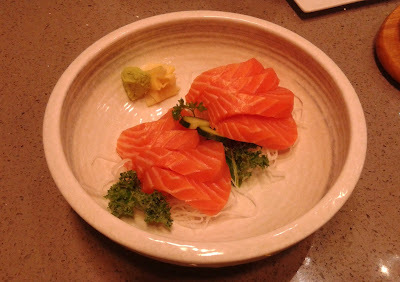 The Atlantic Salmon Sashimi was the best I have ever eaten. 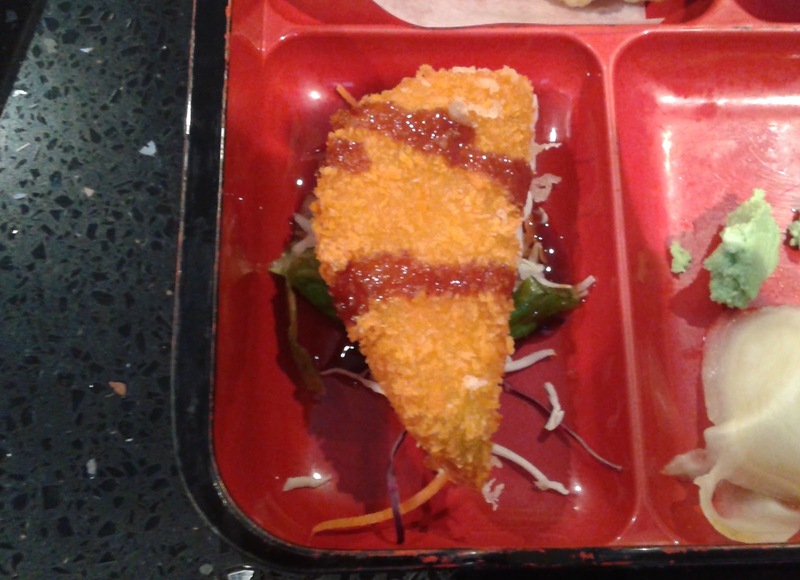 It had a remarkably fresh and buttery flavour, and a slightly toro-like melty texture that made it virtually perfect. Also very fresh were the tai (snapper), sockeye salmon, tako (octopus) and ika (squid). Unfortunately, the tuna had a fishy flavour and the toro was not very soft. The Tamago was missing the fluffier, lighter texture I had expected. This wasn't the perfect plate of Assorted Sashimi, but overall, it exceeded my expectations. 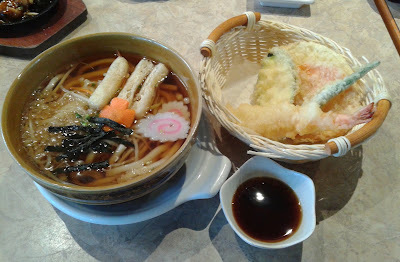 The tempura for the Tempura Udon was well executed. The batter was light and crunchy, and the prawn had a good snap. 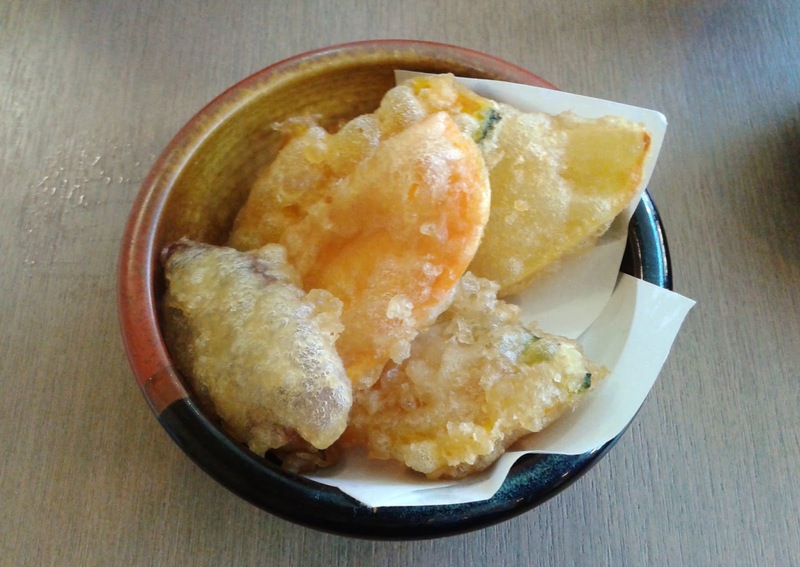 The zucchini tempura and the green bean tempura were both juicy, and the sweet potato tempura was quite rich in flavour. The only piece I found a bit dry was the yam tempura. Moving on to the left side, I enjoyed the udon broth, which was neither too rich nor too watery, as well as the udon noodles, which I found to be on the softer side but with a good rebound. The chicken in the Chicken Teriyaki was tender, and my dad remarked that the steamed rice was above average. I also enjoyed the stir-fry bean sprouts, which absorbed the teriyaki sauce well. 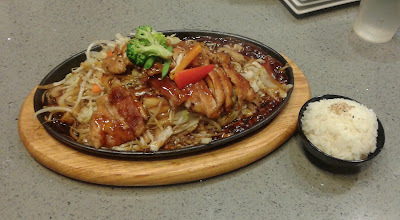 The teriyaki sauce was well-balanced and not too salty. Due to the supreme freshness of the salmon in the Assorted Sashimi, my sister and I decided to try their Seared Salmon Nigiri. 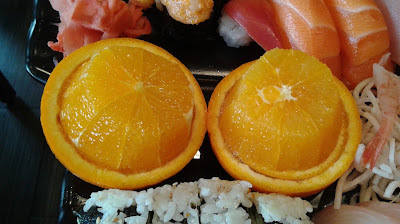 The two pieces of nigiri arrived on a hot plate. The seared salmon was juicy (though lacking a smoky flavour), but whatever flavour the salmon had was masked by the strangely sweet sushi rice. It tasted a bit like they took some of the berries from Krause Berry Farms and mashed it into the sushi rice. Did they make a mistake somewhere? Since we were quite impressed with the Prawn Tempura from the Tempura Udon, my dad called for an additional order of Prawn Tempura. The prawns were juicy, meaty, and undoubtedly fresh. At last, I have found in Langley what I can call a good Japanese restaurant. The service was good, the prices were very good, and the quality of the food was good (other than the Tuna Sashimi, which my dad kept calling a fail). Something I found quite surprising was how the restaurant was nearly empty at dinner time on a Saturday evening. Am I missing out on an even better restaurant in Langley, or does location really matter that much? Risty's Café & Sushi Bar is a small restaurant at the south end of Granville Street that serves both Canadian and Japanese food. No, I do not mean Canadian-Japanese fusion. 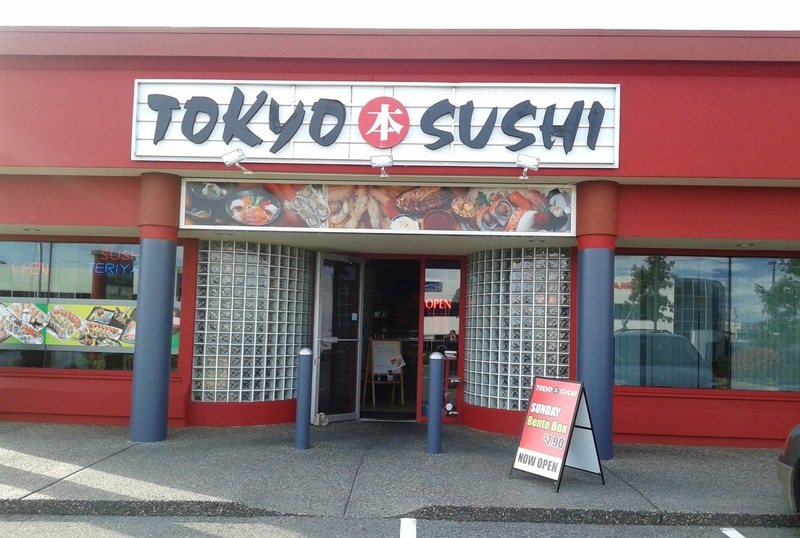 Instead, this is probably the only place in Vancouver where you can order a hamburger and a sushi roll in the same meal. I invited my friend Tamsen so that our combined appetite would be enough to let us sample items from both the Canadian and Japanese menus. To my great surprise, I found out that Risty's is actually Chinese-operated. Our first item was the 12-piece Sashimi Platter. The Salmon Sashimi had a nice smooth sheen, but Tamsen found a really tiny bug having the time of its life on one of the pieces of salmon. When we alerted the waitress, she promptly provided Tamsen with another piece of salmon sashimi that was twice as big (I will not assign a grade since a replacement was provided). Moving on, the Tako Sashimi was chewy with a nice subtle lemony flavour. The Hokkigai Sashimi was the best of the bunch, while the Tuna Sashimi was a touch too dry and the Tai Sashimi could be smoother. 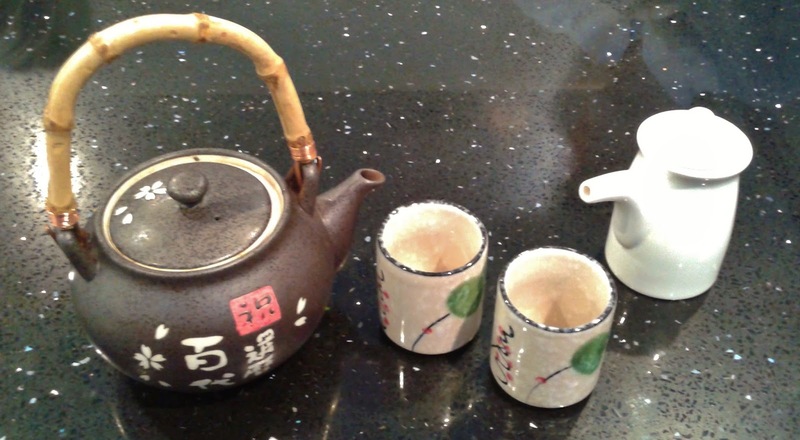 Taste-wise, the tai had a delectable, faintly sweet flavour. The Risty's Roll consisted of prawn tempura, cucumber, avocado and spicy tuna. The best part of the roll was the avocado, which was really fresh and prominently delicious. 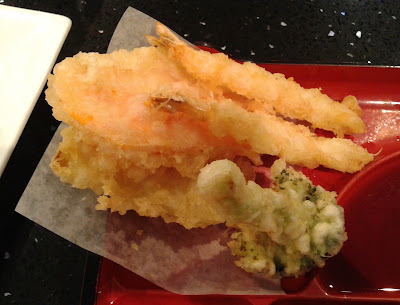 The prawn tempura was sufficiently crispy, and the flavour of the prawn worked very well with the avocado. 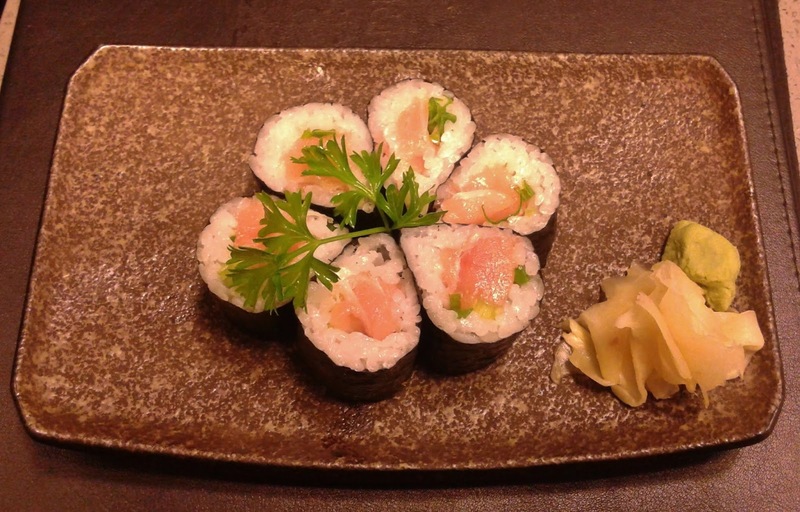 This roll comes with a small side of salmon fries too. There were lots to like about the roll, except... what in the world is up with the mayonnaise?! There's as much friggin' mayo on this roll as there is icing on a gingerbread house! Scooping off some of the excess mayonnaise onto my dish did not make for a pretty scene either. 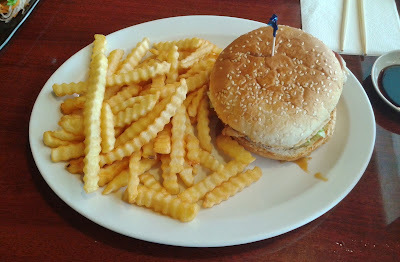 On a positive note, the waitress was quite friendly and put effort into making our visit as enjoyable as possible. For the most part, the food tasted alright, but there was a rather significant mishap with each of our dishes. I left the restaurant thinking, "Did we visit on a bad day?" On our way back from Chilliwack, we decided to go shopping at Highstreet Shopping Centre, a newly built outdoor shopping centre on the western fringes of Abbotsford that seems to be overtaking the older Sevenoaks Shopping Centre in downtown Abbotsford. Now, as much as I love sushi, I'm not particularly keen on eating it multiple times on the same day, so I let my parents choose where to have dinner. My parents were in the mood for Asian food, and we wandered around the whole shopping centre several times only to find that Ono's Sushi was the sole choice that fit that criteria. Alas, two sushi adventures in one day it is! First to arrive was the Miso Soup that accompanied the Chicken Teriyaki. 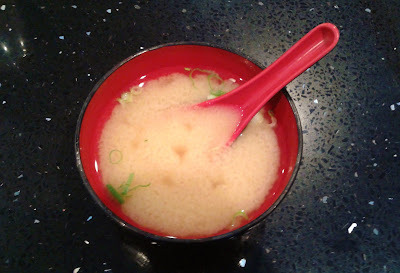 This Miso Soup came with green onion and tofu. My dad wanted the Miso Soup, so I let him have all of it. However, he remarked that it was so salty that he was unable to finish it. This rarely happens, so I'll assume that the Miso Soup wasn't any good. The Chicken Teriyaki came in a large teppanyaki plate with a heavy dose of stir-fry bean sprouts and cabbage. 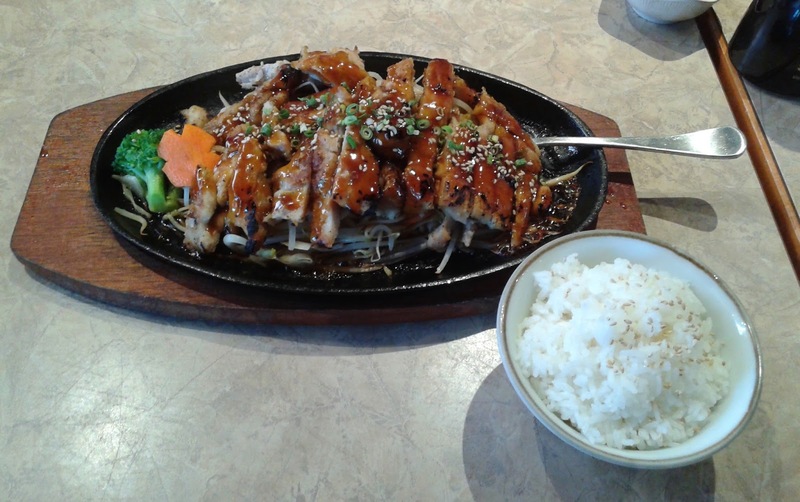 The skin for the teriyaki chicken was crispy and savoury. The small amount of black pepper sprinkled on top helped to liven up the flavours further. If anything, the chicken could be a bit more tender. My dad does not like reading menus, so he decided to order with his eyes instead by going all the way up to the sushi bar and visually inspecting the raw fish. He ended up selecting the Salmon Sashimi, and lo and behold, it was a success. The salmon was markedly fresh and had the sought-after creamy, buttery flavour. The slices were also on the generous side, though a few of the pieces could be softer in texture. Arriving on a paradise-sized plate was the Paradise Roll, which consisted of crab meat, avocado, cucumber, salmon, mango, green onion, and a special sauce (which turned out to be spicy mayonnaise mixed with teriyaki sauce). There was a good amount of both spiciness and salmon. The crab meat was soft and had sufficient sweetness. Overall, the flavours were pleasantly harmonious. Ever since having the Negitoro at Kami Sushi in South Surrey, my sister has been craving negitoro. I really liked the juicy un-minced pieces of toro inside the roll, as the Negitoro Roll is often served with minced tuna instead. That being said, neither my sister nor I got very excited about this roll due to the overly dry sushi rice. We found the service quite friendly, though it would be nice if there were more waiters or waitresses so that the diners could be more adequately and more efficiently served. Overall, the quality of the food and the portion sizes were fair considering the slightly higher prices. 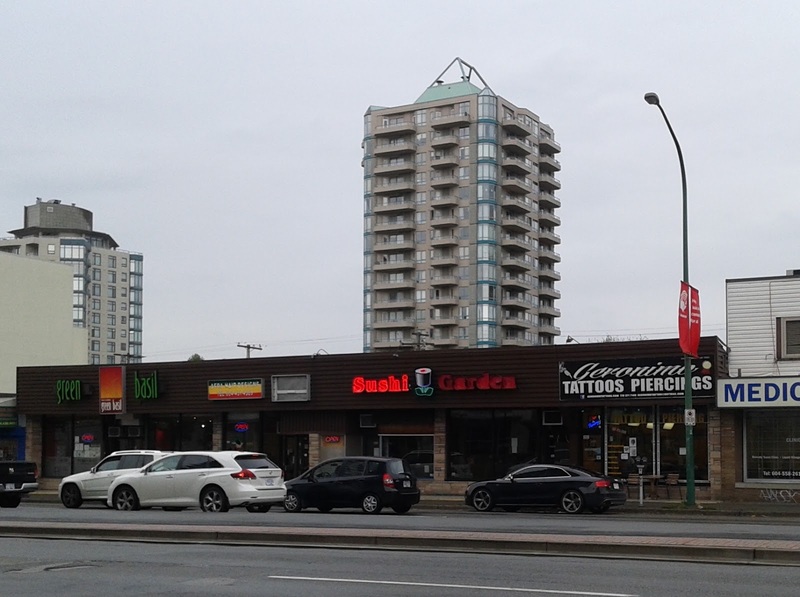 I should also note that the prices of sushi tend to tick up slightly as you head east past Langley, so this restaurant may only be moderately priced compared to nearby Japanese restaurants. With summer vacation slowly meandering to a close, my dad suggested that we go on some travelling for sushi. By travelling, he meant a two-hour drive or less. As the U.S. dollar is so high that cars at the border are beginning to flow in the opposite direction, we decided to head east instead. My dad drove all the way to Chilliwack before I got too hungry and declared that I had to eat immediately. Yale Sushi is reportedly one of the best sushi restaurants in Chilliwack, and since that's where my dad decided to park, that's where we ended up eating. 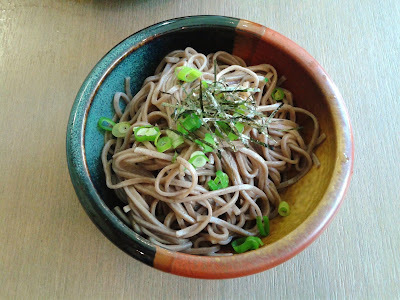 The restaurant is Korean-operated, and we were pleasantly surprised by the clean, modern decor and the spacious seating. There was a good flow of customers during our visit on a weekday afternoon. The tea set that arrived at our table was so exquisite that my dad insisted that I take a photo of it and post it on my blog. As I was busy arranging the tea set, I put my mom in charge of ordering since there were enough photos on the menu to allow her to choose properly. To try a bit of everything, my mom ordered the Lunch Special C, which came with a Miso Soup that contained green onion and tofu. 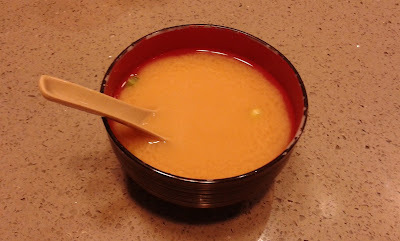 I found the Miso Soup pretty standard fare, although slightly heavy with the salt. At the speed of lightning, the rest of the Lunch Special C arrived in a large lunch box. The food wasn't necessarily inexpensive, but we found the portion sizes quite generous! 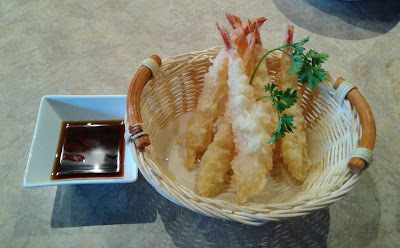 The Tempura was executed better than I had expected, and the flavours of the ingredients were preserved well. I liked the sufficiently sweet Yam and Sweet Potato, while the Broccoli was a bit dry. The two pieces of Prawn Tempura were decent with ample moisture. 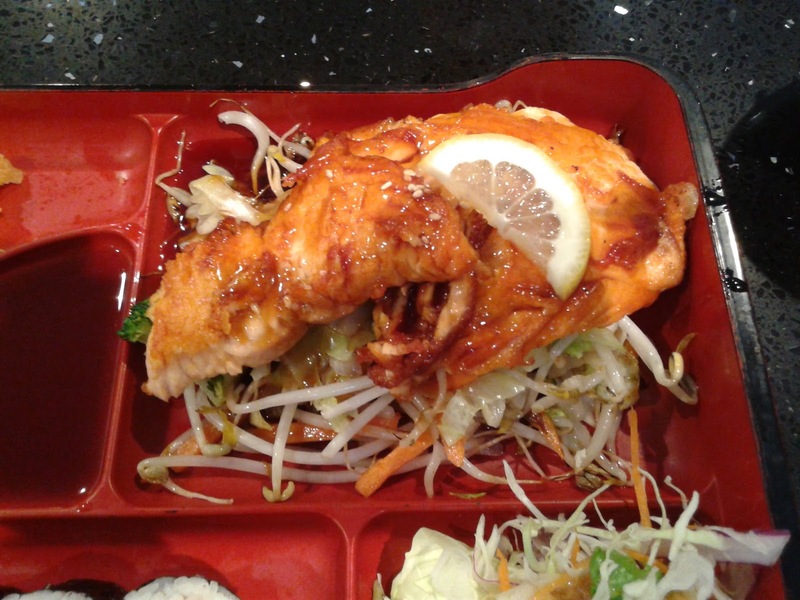 The Salmon Teriyaki was slightly crispy on the outside and juicy on the inside. I would have preferred more moisture as I found some parts of the salmon dry, but the salmon was fresh with a decent amount of flavour. The stir-fry vegetables were savoury as well. The Tuna Roll was neatly constructed and came with fresh tuna. However, I found the sushi rice too tightly packed and teetering on being too dry. 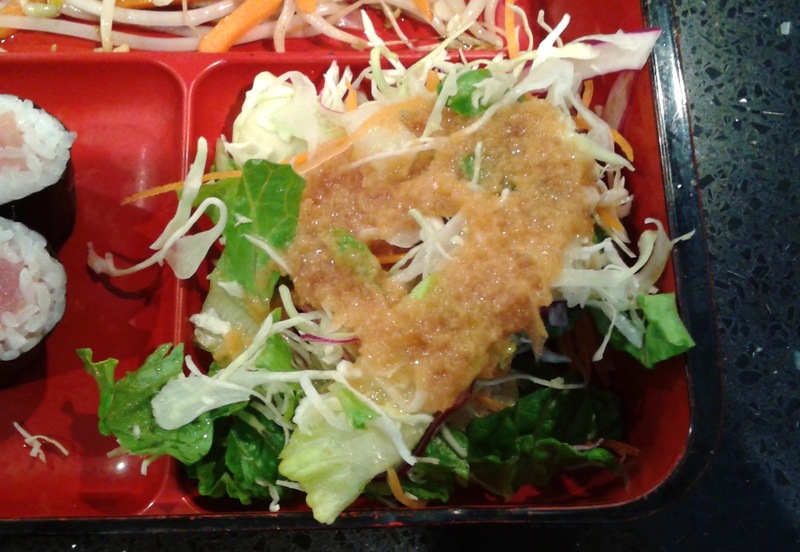 The Salad consisted of assorted greens dressed with a mildly tangy Japanese salad dressing. The vegetables were cut into small pieces, making it easy to digest. 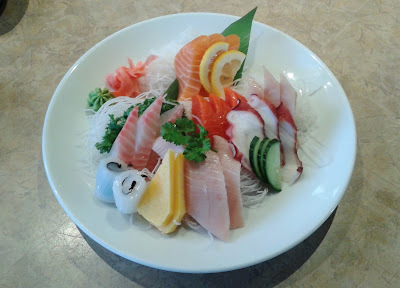 I wasn't expecting fresh sashimi to make it this far into the Lower Mainland, so I was quite surprised when the sashimi ended up being fresher than the sashimi at most Vancouver restaurants! 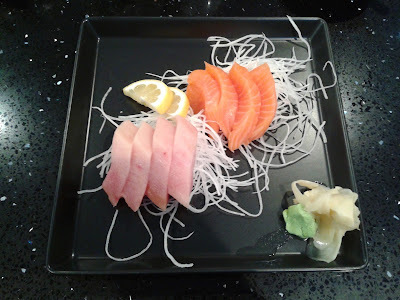 The Tuna Sashimi had an excellent soft texture, and the Salmon Sashimi had a delicious buttery flavour. Since my sister is a fan of spicy tuna, we had the Red Dragon Roll, which consisted of prawn tempura, crab meat, cucumber, spicy tuna, crispy crumbs, and spicy sauce. There was a generous amount of spicy tuna on top, and it wasn't mashed, so I could taste the small blocks of tuna melt in my mouth. 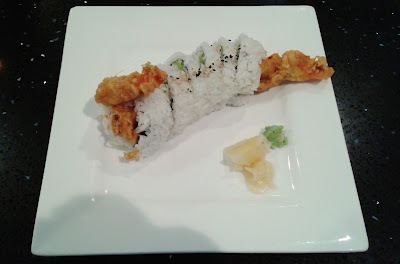 There was also a good amount of spiciness to the roll, and the flavour of the prawn tempura inside was showcased well. My mom had no idea what a Spider Roll was, so when she asked me, I told her that they take a huge spider, deep-fry it, and then put it in a sushi roll. (It's supposed to be made with soft-shell crab.) She wasn't fazed at all and decided to order it anyways. This Spider Roll came with deep-fried soft-shell crab, avocado, crab meat, and cucumber. The soft-shell crab lived up to its name and was sufficiently crispy and moist. There were large portions of crab in the outer pieces and very little crab in the inner pieces. 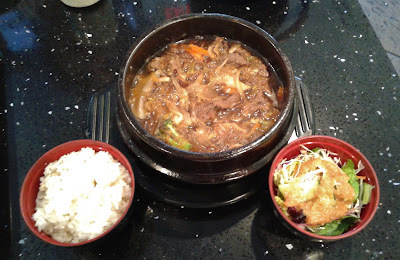 My sister is a huge fan of Korean food, so we also had the Beef Hot Pot, which came with marinated beef and vegetables in a Korean-style hot pot, some steamed rice, and a salad that was identical to the salad in the Lunch Special C with the addition of what appeared to be dried cranberries. Although the aroma of the hot pot differed from a sukiyaki, it tasted quite similar. The vermicelli noodles absorbed the beefy flavour of the broth well. Some of the pieces of beef were decent, while some were sliced too thick and became overly chewy. The service was friendly during our visit, and the Korean waitress was very patient as well. The only thing we found strange was that our bill arrived mere minutes after the Beef Hot Pot while all of us were still eating. In fact, we were not ready to pay the bill until 20 minutes later. Did they not want us to order any more food? 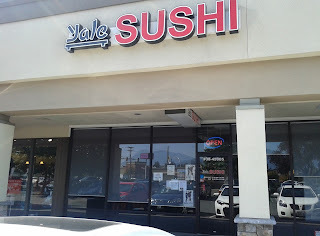 Other than that, we very much enjoyed our experience at Yale Sushi. The food was obviously superior to anything I've had in Langley, and I wouldn't hesitate to say that this was a lucky find!